Hmmm, looks like not that much has changed, only I don’t blog DAILY like I used to. Daily. Excellent for downloading the brain and building a blog, but not so brilliant for putting actual words in actual novels. 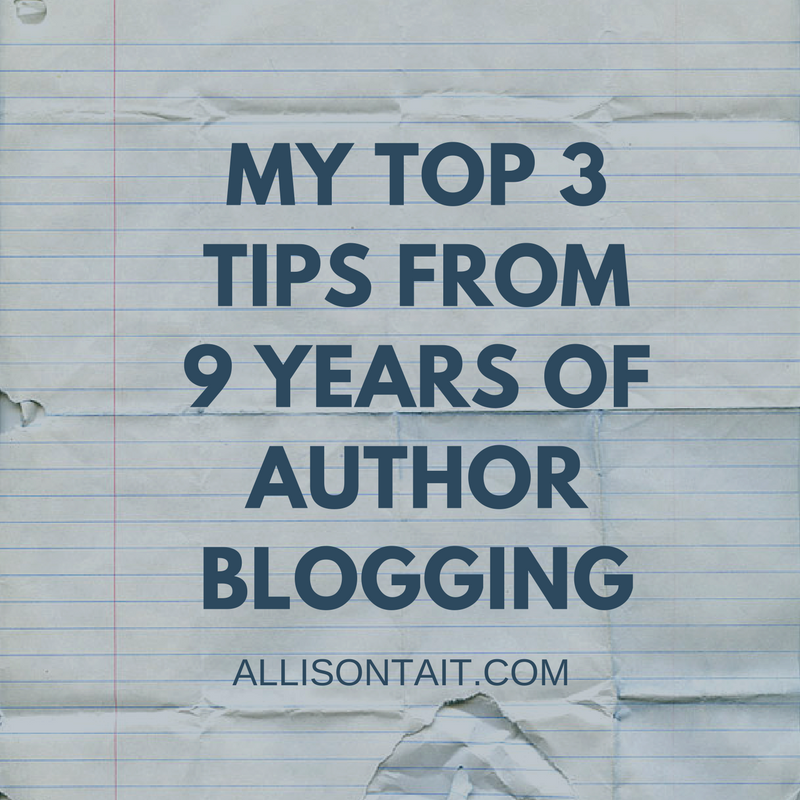 To celebrate entering my 10th year of blogging – which makes me pretty much a centenarian in blog years – I thought I’d rustle up my top three tips specifically for author bloggers. It took me about five years to get to the bottom of this. I started out with the blog because a wise friend suggested I should. I blogged daily because a) I liked it and b) that’s what all the blogging experts said you should do to build a blog. I realised that I’d written 350,000 words on my blog one year and cut back to three times a week because – well, 350,000 words is about three adult fiction manuscripts.Lots and lots of people visited my blog. People approached me about taking advertising, raising the word ‘monetise’. I said no*. She was right. I looked at all the things I was doing on my blog. I mean, really looked at it for the first time in five years. And I made some changes. I blog to share my thoughts, an insight into my author life, and news about my books. I try to share useful information and insights about writing and publishing because I know that’s what my community wants (how do I know? I asked them). I offer space on my blog to other authors because I strongly believe in sharing the love and the insight, and I keep lists of recommended children’s books because I know, as a parent, how difficult it can be to keep kids reading. This blog is not about traffic, it’s about community. As I wrote in my fifth year of blogging, I blog because it’s worth it. There’s an awful lot of information out there about blogging – from optimal word lengths for posts to how many sub-heads you should have to which latest tech improvement you should be making the most of. 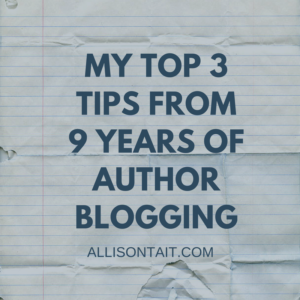 My advice for author bloggers? Don’t overthink it.You are an author. You are a writer. So, write things. • what am I thinking about? • what can I do that’s useful? And then I write about one of those things. I don’t ignore SEO, but neither do I obsess over it. I try to think about what I would search to find that particular post and I go with that. Every year when I write my annual ‘what I’ve learnt in X years of blogging’ post I come back to one thing: blogging has been so very good for my writing. When I began the blog, I was a fulltime freelance journalist (or as fulltime as one could be with a three year old in tow) and I had been writing for magazines and newspapers for nearly two decades. I had a very well-defined, most excellent broadcast voice. An outside voice, if you like. What blogging every day gave me was my own voice. My inside voice. Good blogging requires you to look closely, to reveal what you think, how you feel. It shows you that a whole story can be found in a tiny moment in your day. As an example, compare my first ever blog post with this one, where I was starting to get the hang of it all. Blogging was a great tool for helping me to find my voice as an author. Obviously, you don’t need to go public on a blog to do this, but if you’re struggling to really find ‘you’ in your writing, look at a daily journal of some kind. But there is something about ‘putting it out there’ that helps to focus the mind – and, of course, bring readers to your website. And now… here’s to another 12 months! Or take a look at my online course at the Australian Writers’ Centre on How To Build Your Author Platform. *For the record, I did introduce bookseller affiliate links on the blog around 18 months ago, as per the disclosure here.